“This place eats away at you,” says Keire of his hometown, Rockford, Illinois, where he and his pals, Zack and Bing, grew up performing bruising stunts on their skateboards. He relishes the fleeting sense of control he sustains while skating, until he wipes out. Sure, the hobby may hurt him on occasion, but so did his dad, and he still loves the old man, though it’s telling that Keire finds catharsis in stomping on his boards until they splinter. These three young men are the subjects of “Minding the Gap,” a new documentary from Kartemquin Films that ranks alongside the year’s greatest cinematic achievements. Making his feature debut, director Bing Liu holds his camera on the faces of his longtime friends, illuminating the buried pain that they share, as well as their need to escape it. The fact that all three men are victims of domestic abuse is alarming but also quite commonplace in a town like Rockford. Having spent a great deal of time there myself, it is clear to me that Liu understands the area so completely that its essence has seeped into the marrow of his bones. This is a city where nearly half the population is paid below the minimum wage for working jobs that are gravely understaffed; where funding is slashed for street lights in crime-ridden neighborhoods; and where the residue of violence clings to the interior of houses that were meant to comfort and protect. “I saw myself in your story,” Liu explains to Keire, who likens the experience of making the movie to “free therapy.” As the filmmaker struggles to come to terms with the wounds inflicted by his own upbringing, he starts to see echoes of his abuser in the increasingly unsettling behavior of Zack. When Liu films his mother and simultaneously confronts her about the abandonment he felt as a kid, he keeps a separate camera fixed on his face, drawing attention to his own inability to break free from the pain of his past. Assisted by co-editor Joshua Altman, Liu weaves these stories together, forming a seamless symphony of anguish and euphoria that culminates in an extended montage so deftly executed, it left me in awe. 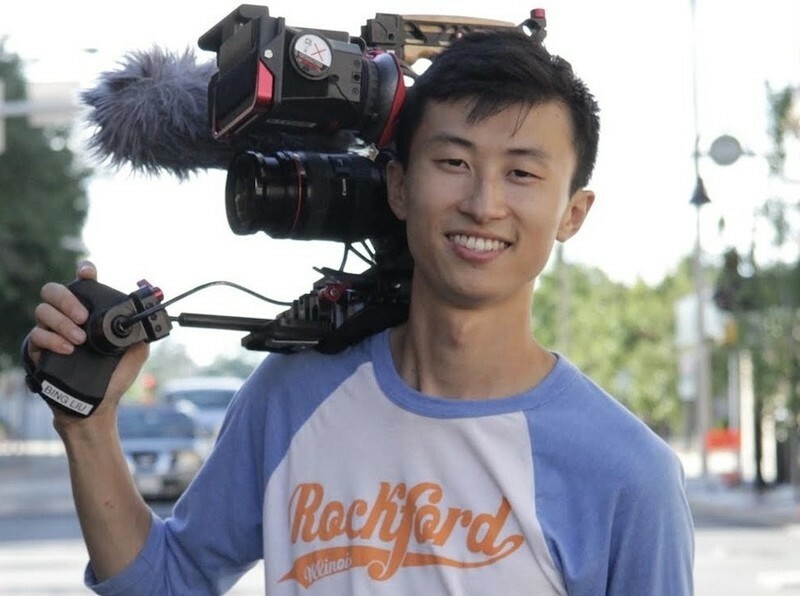 Liu, who also served as a segment director on Steve James' "America to Me" series premiering this Sunday on STARZ, recently spoke with RogerEbert.com about his rewarding collaboration with Altman, his exciting approach to cinematography and his belief in the healing power of cinema. This film hit me on the deepest possible level. I knew someone in Rockford who was abused by their stepfather and then guilted by their church community into forgiving him. What role does community play in a place like that? Community can be really powerful in terms of helping you find an ad hoc family, but in a place like Rockford, you are sort of limited with the types of communities that you can seek solace in. Rockford is a mid-size city, so it’s not run by one single factory or church. But still, when you’re an adolescent, if you’re not a jock or a cheerleader, you’re going to have a hard time fitting in. There’s only one outlet for you, and that’s with the outsider group. As for what you’re talking about, communities can have this self-policing aspect to them, and it just adds to the problem by causing things to repeat themselves in cycles. We’ve seen that it in the Catholic Church. At what point do we put the needs of the community above preventing the cyclical pain, suffering and torture of individual people? The cinematography in your film captures the exhilarating, free-flowing movement skateboarders can achieve on the town’s oft-vacant streets. For me, it’s all about human perspective. When I started making skate videos in the first couple of years, I was using a fisheye lens, pointing it down low and focusing in on the board while you’re looking up. You just see the sky and the lens distorts the skater so that their head appears small in the frame. On this film, I simply turned that technique on its head by having the camera a little bit above eye-level. It’s a wide lens, so movement is more dramatized. The biggest things in the frame are the faces of the skaters. It’s very subtle but that’s the biggest difference. It’s less about the skating—the skateboard is actually far from the frame. It’s more about the feeling that you get while you’re gliding over concrete. I’ve been in the camera department for many years, and I’ve worked with a lot of Steadicam operators. I’ve seen them run full-speed when filming a chase scene and it’s pretty incredible. I saw that as a guidebook for how I would go about lensing the skateboarding in this film. Of course, I couldn’t afford a Steadicam rig, but I learned the science and the techniques behind it. I just applied them to the poor man’s version, which is the Glidecam with the DSLR. I was running on foot most of the time, unless Zack and Keire were going to skate a quarter mile, and then I would hop on a board. What was fun about running was that I could incorporate what I had learned from watching Steadicam operators. I had seen them run backwards and do loops around somebody while the person is moving, and that is unseen in skateboarding footage. It took me a while to get to that point where I was good enough at it, where it just felt like intuition. By the time I got there, it was just as fun to film skateboarding as it was to do a line or try new things while skating. What’s cool about skateboarding is it’s so difficult. Even if you get good at it, it’ll still take you multiple tries to do a sequence of tricks on the board. I had so many opportunities to capture every sequence that I was improving and figuring out the shot just as the skaters were figuring out what they were doing and what could be improved. I love “Short Term 12.” It’s easily one of my top 15 films of all time. But it’s funny, a lot of the temp score that I used for “Minding the Gap” was actually from “Mustang,” another great coming-of-age film that also has a melodic, deep-rooted emotional feeling. I’m currently making a documentary that I had developed a year-and-a-half ago which has used a lot of “Short Term 12” in its temp score. It deals with young men aged 18 to 24 who are experiencing gun violence here in Chicago. For that project, I was very influenced by Joel’s music. “Short Term 12” was super-influential to me in general. It’s one of those great films that takes adolescent emotions seriously. That’s why I love “Eighth Grade” so much. It simply respects an eighth grade girl’s emotions, and we don’t even realize how rare that is. The story shared by Jayden (Kaitlyn Dever) in “Short Term 12” about the octopus is one of the most powerful monologues ever written about the impact of abuse. Yes! It is so heart-wrenching and just captures it all. How did you and co-editor Joshua Altman go about juxtaposing the stories of you, Zack and Keire in such a way that they echo each other? It is, quite simply, some of the finest editing I’ve ever seen. I’m glad you want to do a deep dive into the editing process because I had such a great experience working with Josh. In February 2017, I got a call from Davis Guggenheim, the filmmaker, who told me that he wanted to develop a project about young men in Chicago and a program dealing with gun violence. He gave me some funding, asked me to shoot a short film, and invited me to come out to LA and edit it. I arrived in LA later that spring after doing the shoot, and by that point, I had been editing “Minding the Gap” for years. I was editing while I was going along, which entailed everything from compiling scenes I was excited by to making assemblies and doing rough cuts that I’d screen at Kartemquin. The people in LA recommended Josh to me, and when I looked at his IMDb page, I realized that I hadn’t seen any of his films. But he had a lot in his filmography, so I agreed to work with him. As we sat in the editing room on the first day of working together, it was weird to see for the first time somebody else cutting up footage that I had shot. For the first couple weeks, I was frustrated because I just wanted to go in and do things myself, but I didn’t have the time. He asked me to start sending him transcripts of interviews, and I only had three or four of them written up. I went to [producer] Diane Moy Quon and asked if she could get Kartemquin interns to start pushing out every interview I’ve ever done, and that I’d highlight the ones that are important first. So Josh went through the transcripts and then he called me, saying, “I didn’t realize you had all this stuff. We can make a really powerful film out of this.” We sat down for a couple days, and I showed him footage while working on an online whiteboard called RealtimeBoard. He suggested that we build a story for each character—one for Zack and one for Keire—that would stand as their own film. We’d build it together, I’d cut it, and then we’d go from there. After cutting both films, Josh said, “I think we can get this into Sundance.” And I was like, “Oh…okay!” [laughs] Then I asked, “What about my story?”, and he said I should consider cutting myself out of the film because he couldn’t see how my scenes would fit into the rest of it. I thought they were important, so we decided to deal with it later. They are absolutely essential, and you make a pointed decision of having a camera on your own face during the emotionally grueling interview with your mother. Putting myself in “Minding the Gap” was my attempt to get over the paradox of a filmmaker being vulnerable in a movie where they have control. I needed to find a way to relieve myself of that control. Digging through the shots we had of me, it was hard to find a moment where I sort of broke. I don’t think there would’ve been any other way to show true vulnerability without it feeling a bit manufactured. Luckily, “Kailash” went on hold for two months because the filmmakers had to figure some things out, so Josh’s schedule was freed up. I rented an Airbnb in Venice, Los Angeles, where Josh lives, and we just holed up there with two laptops. I’d cut on mine, he’d cut on his, and we would arc out the story before splitting it up into reels. He’d take a reel, I’d take another, and every so often, I'd ask Josh to come look at a scene in order to give me some perspective. Or he’d ask me a question like, “Is there some nighttime driving somewhere?”, and I’d say, “Check the footage from October 2015.” We’d stitch together our reels, watch them, and then go have a beer or surf. The next morning, we’d talk about what was working and what wasn’t. For two months, we repeated that same routine until Josh had to go back to “Kailash.” I sort of took over after that, and sent him some cuts. We submitted the film in early October to Sundance, and I took a trip to Hawaii because I was so burnt out. I figured that either we got into Sundance or we didn’t. If we didn’t get into Sundance, I would have considered shooting more footage. But we got in and had the picture locked within a week. Steve James reassured me by saying, “This happens to every film I’ve ever done. I open it back up after Sundance and make changes.” So I viewed Sundance as one big series of feedback screenings. I sat through every screening and I read the audience each time. It was painfully obvious what we didn’t need to keep in the film. After Sundance, Josh and I got back together to cut the film from 98 minutes down to 82 minutes for the television broadcast. I was like, “We don’t need that and that,” and he’d be like, “Yep.” I got it down to the correct time in one night. I decided to just get the emotional part out of the way by cutting everything before showing the new version to Josh in the morning. Now Josh and I are co-directing a film together. What your documentary illustrates so masterfully is how the creation of cinema as well as the experience of it can heal deep-seated wounds. Healing begins when you are able to open up about things that are painful. I believe in the power of cinema to help you survive. Films like “Kids” and “Gummo,” as well as songs like “This Year” by The Mountain Goats, along with various books, are what got me through my childhood. It’s all about feeling like you are not alone, and that’s the hope these stories provide. Other people have found a way to survive. I don’t know how they did it, but they did, and I can too.